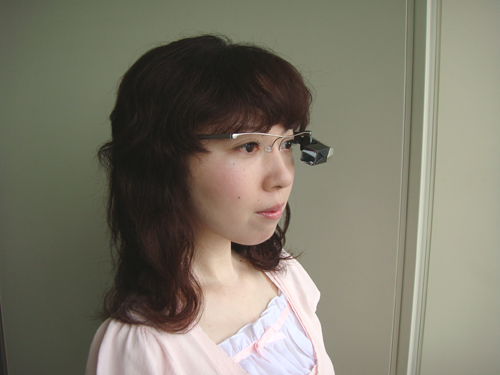 Cool NEC is developing a head mounted display named Tele Scouter which it hopes to begin shipping somewhere in 2010. The eyepiece shown in the image below has some really neat features like front facing camera and eye tracker. This enables a remote server to see whatever you're looking at, and send you some relevant content to be displayed on the little screen. Not so cool- it's going to cost a small fortune, and NEC is only planning to sell about 1000 of those in the next three years. More details on SlashGear. Cooler Fellow Japanese company, Brother Industries is not left behind. Apparently they developed a light-weight HMD (by light-weight I mean 350 grams including batteries) that should also hit the stores in 2010. Like in Tele Scout's case this unnamed HMD superimposes the image it generates over reality, not blocking the user's view. So why is it cooler than NEC's device? Well, they use terms like "green diode lasers", and if that doesn't make you blind, it's surely very cool. More details on TechOn. Though none of those devices (certainly not the last one :)) is aimed for the AR crowd, I guess that enthusiasts will find way to harness them for cool demos. Don't forget to read Tom's review of more concrete offerings from ISMAR. Researchers from Tokyo Institute of Technology and the University of Electro-Communications may have created the cutest AR creature to date. In the last SIGGRAPH conference they have presented the following poster, discussing a haptic ring that let you pet virtual creatures (VC) and enable virtual creatures touch you. they are stroked gently, and they step away after a strong hit. More details can be found here. Via Development Memo for Ourselves. 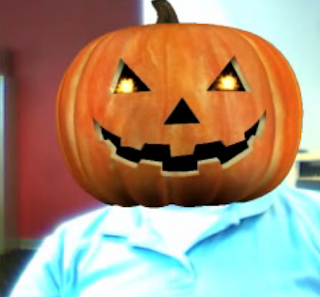 Following are some AR tricks and treats I've collected over the last month, which make me think this Halloween should be declared as the first augmented holiday. Judge for yourself. Here's a direct link for one of the upload videos, to get a better idea. Know of any other Halloween related augmented reality project? Tell us about it in the comments. If you hadn't read it yet, you sould - Ori's ISMAR summary: "Top 10 tidbits reshaping the augmented reality industry". I've found his sixth bullet point, the shortest of them all, the most interesting. Microsoft is pursuing augmented reality, and they have a plan. Also check out Ori's impressions from the Mobile Magic Wand seminar. By far the most numerous reports come from Gail Carmichael who covered rather extensively the "Falling in Love with Learning" workshop (part two and three). She also had a post on the Handheld AR Games workshop, and a post covering a bunch of ISMAR papers that revolve around human factors and user interfaces (which is my favorite, touching on some surprising results). Gail also made a video summary of some of the demos presented. Thomas Carpenter had an excellent review of the head mounted displays presented at the conference. Above all, it's Tom's enthusiasm that makes me feel depressed that I missed ISMAR. And of course, Robert Rice shares his impressions from ISMAR. His post made me wonder whether there's a place for another AR conference, dedicated to the industry (while ISMAR will mainly be for the academy). If augmented reality really takes off, I bet O'Reilly will set such a conference. I'm pretty sure more posts will come later this week (I'm looking at you Tish), and I've probably missed a few that were already published, so feel free to add links in the comments. In the meanwhile, today we have not one, but three weekly videos, all coming from ISMAR. For their latest campaign, promoting Burger King's one dollar menu, ad agency Crispin Porter + Bogusky chose to break the mold of former AR campaigns. First, there's no mini-site, the whole experience is neatly contained within a single banner ad. Moreover, there's no need to print a marker. You simply show this ad a one dollar bill and it shows you an item from BK's one dollar menu. You flip the bill and it shows you another item. Finally, when you hide the bill from your web cam, your face is covered by a king's mask. Apparently it works with other bills and even white sheets of paper, so you can give it a try. The banner is featured over here. Not going to ISMAR :\. Since going to Florida is not an easy trip for me, I would have like to stay there for more than a couple of days. However, my current workload maje such a vacation impossible. I'm sure Ori and Thomas will do a great work covering it. In the meantime, I'll take the next few days off from blogging, and will be back with my 200th post (woot!). Hope to see you all at ISMAR Korea! YDreams' blog - what's augmented reality added value? Fast Company - "Augmented Reality is Both a Fad and the Future"
If you have a friend that doesn't know a thing about AR, let him watch O'Reilly webcast where Chetan Damani of AcrossAir explains it all. Following Wikitude, media favorite Layar is now on the appstore. Following Yelp, Urbanspoon adds an augmented reality view. Lodestone AR Compass is a browser for the great outdoors. Two bucks and it's on your iPhone. CiviCast (from CiviGuard) is an augmented reality browser for civil services with a lofty goal - "To guide & protect global civilian populations in the event of a crisis through authoritative & reliable information delivery over mobile communications networks." Can't even call it a browser, 3d Compass is just a floating compass for Android. Columbia University's submission to ISMAR09 - Augmented reality used for maintenance and repair by the US Marine Corps. A more detailed video of what the augmented reality experience to promote the Transformers DVD would look like (hope it's better than the movie :). The weekly video is from the Australian band Lost Valentinos. In order to promote their latest single (Nightmoves) they chose (what a surprise) to use augmented reality. We have seen AR clips before and AR used to promote singles as well (see for example this application for Eminem). However, Lost Valentinos found a simple yet ingenious way to use augmented reality - they shot each band member perform the song on its own, match each one with a marker, and let their fans to compose their own videoclip via AR. As the press release says - "From lead singer Nik performing the song atop a user’s shoulders, to the whole band playing the song at the base of the Eiffel Tower". Try it yourself over here (and btw, don't search for nightmoves on Youtube from work). Genuine Interactive came up with these augmented business cards for its staff, which have been named "the butterfly effect cards". Thomas has dedicated a whole post for their demo. Visualcard.me on the other hand, lets you create your own AR enabled business cards, that shows your Twitter and Skype accounts. I'm sure those two companies are not going to be the last ones that come up with this idea, so stay tuned. * Alas, I'm not in Australia. Another fine installment from Christine Perey for O'Reilly Radar, where she envisions a world where reality is a huge catalog. Finally, someone has put into words my vision about true AR marketing and not the gimmicks we see these days. One day, you’re sitting in a café reading the news on your phone and you notice that the person next to you has some really nice footwear. No QR code on the neighbor’s shoes? No problem. You start up your visual search application (no, it’s not available on all handsets), act like you are trying to find something on the newsreader screen while you turn off the camera’s “snap the photo” sound, then discreetly aim and take the photo of the shoes. No one has noticed, right? You wait, you act like you’re still reading the news. Your mobile browser opens and on your screen is the exact model of shoes on your neighbor’s feet. Another click and you can check the price and availability from stores nearby. Tish Shute continues to advance her cause for Google Wave based augmented reality environment and then interviews Jeremy Hight about his projects, mapping and social augmentation. We are in an age of cartographic awareness unseen in hundreds of years. When was the last time that new mapping tools were sold in chain stores and installed in most vehicles? When was the last time that also the augmentation of maps was done by millions (Google map hacks, etc)? The ubiquitous gps maps run in automobiles while people post pictures and graphic pins to denote specific places on on-line maps. Jamais Cascio writes for the Atlantic about why augmented reality can evolve into a self imposed 1984-like scenario. Conceivably, users could set AR spam filters to block any kind of unpalatable visual information, from political campaign signs to book covers. Parents might want to block sexual or violent images from their kids’ AR systems, and political activists and religious leaders might provide ideologically correct filters for their communities. The bad images get replaced by a red STOP, or perhaps by signs and pictures that reinforce the desired worldview. Did I mention that the “wrong” people can get replaced too? The guys at Zugara ask the hard question - is an augmented reality campaign really fit your needs. Too often, we’ve been seeing AR executions that are AR just for the sake of using AR. Do you really need to launch a video in AR? Or a 3D asset? Too many recent AR executions are guilty of this and scream, “WHY!! !” Why are you making your consumer go through unnecessary hoops when they can just as easily view the video or 3D asset in a standard player on your website? An AR initiative should not be exempt from Best Practices online, so it’s always important to put usability before the ‘experience’. animations or textures found in Layar and Wikitude 3D. spending any time explaining it. will need to upload it to a repository and manage the updates. So, if you are interested, the source code can be found here. At least one good thing turned out of this dire situation. Hand from Above from Chris O'Shea on Vimeo. Yes, I know, it's not augmented reality according to Azuma's definition, but it's certainly original and a lot of fun. It could have been even more fun, if I could control the hand myself, but my god delusions will wait for now. More details on O'Shea's site, where you should really take a look at "Out of Bounds", another art installation that has a strong AR motif. Yes, the following video is nothing more than a demo for Dassault Systemes AR campaign for the feature film "Arthur and the Revenge of Maltazard". I usually don't give such videos a full post, especially when there's no site I can link to, but it seems like a cute game, and what happens at 1:25 surprised me. Maybe I'm too jaded with AR campaigns that such a trick surprised me, but it made me smile, and that's good enough. It will cost you $3 on the appstore. More details can be found here. Thomas Carpenter updates his augmented reality scale. Nokia's next AR project is set to translate signs in foreign languages. If you are wondering how come there's not one link pointing to a new augmented reality browser, they had their day yesterday. This week's video is of an odd AR application for the iPhone, named Sun Seeker. Basically, it lets you see, overlaid on top of the real world, where the sun is, and where it's going to be throughout the day and year. Pointless? Well, the video does present an interesting use-case when buying a new house. Learn more about it, here. Previously we featured geoPaste, an Android application that lets you draw on real-life. Air Painter is a Japanese Android application with a similar premise, though its user interface seems a bit more refined, as can be seen in the video below (don't worry about the German, you don't have to understand it to see how cool this application is). More information on AirPainter's hompeage, and here's another video. An augmented reality browser with a slick interface for the iPhone, that features results from Google's local search. Like most browsers these days, it also lets users add their own content. Some more information, in WhereMark's homepage. In a nutshell telepresence is a turbo-charged version of video-conference, that aspire to give you the feeling that you are really in the remote location. There are some companies around the world that invest loads of money in developing better and better telepresence experiences, because they believe it's going to be a billion-dollar market. Now, is there a better experience than seeing your remote pal in 3d across the table? Obviously, ACME, the project featured in the above video, doesn't come close to making this idea a reality. But it does let you see you companion's avatar, which mimics his gestures, and share with him a virtual desktop. Have you noticed what just happened? That was natural feature tracking in Flash (powered by Imagination tech). There were no ugly black and white markers, and yet, no plugin (apart from Flash) is used. Is this the first step in the demise of fiducial markers in AR campaigns? So, Mobilizy just released a new update for Wikitude, one that allows you to point your phone at ground zero and see a 3d virtual version of the Twin Towers on the phone's screen. Wikitude Augmented Reality: WTC - Its not there but its there from Wikitude on Vimeo. First we should congratulate Mobilizy for intergrating 3d objects into Wikitude. That's only two weeks after Layar made a similar move. If I understand correctly, Wikitude doesn't let folks upload their own 3d models yet, but that's surely not that difficult. We should also congratulate Mobilizy for a smart marketing move. Yes, it's very respectful, and I actually think that there should be such a virtual memorial. However, one cannot deny that such videos as the above create buzz, something that Wikitude's competitors usually excel at. I can only imagine the impact of such application if they had released it last month, for 9/11. I'm fascianted by how the AR illusion is completly destroyed at around 00:18, when the buildings look very small just because there's a tree in the background. That's not Wikitude's fault, but it just shows us how much there's still to be done to make AR look good. There's no end to the augmented reality browsers phenomenon. Cyclopedia is yet another browser that is based on Wikipedia, Bradesco is helping you find your way around Brazil, and AugmentThis! lets you upload kml files and share them with others. Peak.ar on the other hand is a specialized browser from Salzburg Research that only lets you see the names of mountain tops around the world. While Wikitude is finally available for the iPhone (but you wouldn't know that if you had visited www.wikitude.org as to the writing of this post). So, with so many AR browser available, how are they all doing, buisness wise? Gene Becker collected some appstore statistics, that shows that AcrossAir's applications are leading in terms of downloads among the non-free applications available on the American appstore. Joe Lamantia on why creating AR content should be accessible to everyone, and how to make it so. What's that augmented reality that I mention so much? I guess most of this blog's patrons already know, but here's Scientific American explantion, though I think YDreams' post is far better. Campaigns of the week: One for a game named Operation Flashpoint, the other for Fox's Dollhouse (which looks extra sleazy). This week's video is a lovely tour de force from Oxford's Active Vision Labratory's Robert Castle. Although Ori posted a sneak peak to ISMAR 09, he somehow missed this video. It shows an extension to the PTAMM system that allows "multiple objects to be recognized and localized within multiple maps." (Update: I don't know French). The Citroën DS3 joins the ranks of cars that get an augmented reality campaign, thanks to Total Immersion. Yes, it's not as lame as other cars AR campaigns, with its little racing game. However, it won't be spared from becoming the latest addition to my growing petition to stop using AR to promote cars. As you may have noticed, I took some days off blogging. Can't get myself to blog about yet another AR browser (YAARB™) or some run of the mill augmented reality campaign. However, futuristic concepts still excite me. Check out Matthew Buckland's latest post. With the help of designer Philip Langley, Buckland has conjured a series of illustrations giving us a peak into social network turbo-charged with augmented reality. Below is one such illustration, showing you what's going on in the neighborhood. Can be quite useful when looking for a new home. You can find the other illustrations (and this one in far higher resolution) here. This is actually a new video of a rather old concept by one Soho Marky. The disparity between these concepts and reality reminds us that we are still at the very beginning of a long road. Maybe AR is hot right now, but in the future it's going to be fabulous.